Jamaican and West Indies cricket legend, Ambassador Courtney Walsh, will be a guest of honour at Wray & Nephew Contender on May 22, 2013. In 2000, Courtney Walsh broke the record for holding most Test Wickets, one that stood for the next four years. He captained the West Indies for 22 Test Matches during 17 years of representing the regional squad, from 1984 t0 2001. For the May 22nd staging of Wray & Nephew Contender, not only will Mr. Walsh be a guest of honour, he will also participate in the announcement of the bout’s winner, and receive a presentation for his vaunted place in Jamaica’s sporting history. The Yellow Team’s Devon ‘Concrete’ Moncrieff, and Richard ‘The Frog’ Holmes of the Green Team, will face-off in the quarterfinal bout on Courtney Walsh’s night of Honour. Sixteen professional boxers entered Wray & Nephew Contender for a share of nearly $2 Million in prizes. The winner will receive J$1 Million and the title of Jamaica’s Ultimate Middleweight Boxer and the Wray & Nephew Contender. The second place winner will receive $500,000, 3rd place $250,000 and 4th place $200,000. Launched in 2010, the Wray & Nephew Contender has enjoyed unprecedented success. The television show has enjoyed record viewership during each of the first two seasons and the live fights at the Chinese Benevolent Association (CBA) attract sell-out crowds each week. After two successful seasons of the hit TV series, The Wray & Nephew Contender, and what many have voiced as a resurgence in boxing in Jamaica, the concept of a ‘boxing party’ have emerged from the producers of the popular TV show in Rocky 876. Rocky 876 will unfold history at the Liguanea Club in New Kingston Saturday, July 7th to give boxing and party fans in Jamaica live action at ring side while bouncing to the beat and sipping on their favourite Wray & Nephew mix. Contender Producer and Rocky876 promoter, Sanjay Ramanand explains the reason for the first ever boxing party: “when we looked at how the Contender was being received, we realized that there was a whole social component that was not being tapped into. People wanted to watch the boxing, but they also wanted to drink and dance and just enjoy themselves; so we thought why not mix the two concepts to create something that has never been done in Jamaica before”. 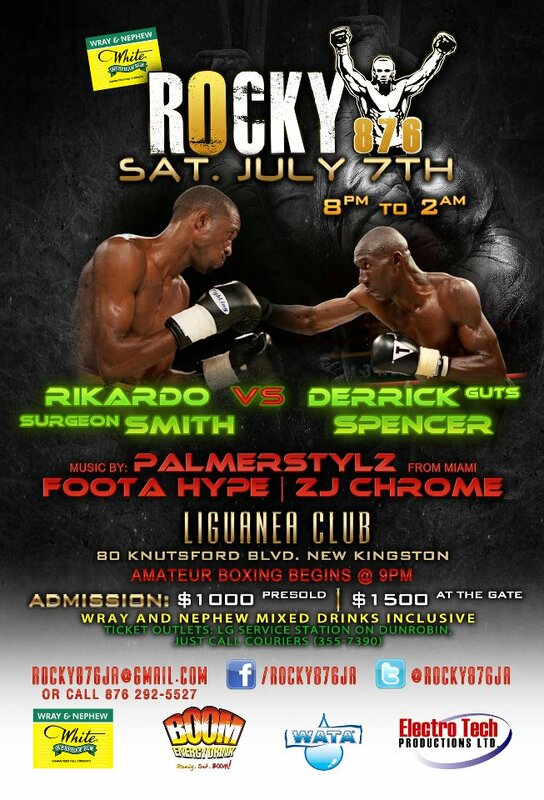 At the July 7th billed event patrons can expect to see Jamaica’s 2011 Middleweight Contender, Rikardo “Surgeon” Smith takes on Derrick “Guts” Spencer (from the 2012 series). Spencer fought runner up Contender, Ramel “Sub zero” Lewis in one of the most watched fights in the Contender series this season and should be in the best shape of his life to take on last year’s winner whose last fight was 6 months ago. The gates open at 8pm and there will be activity from start to finish. With four fights scheduled, the boxing action starts at 9pm with three amateur bouts before the main event. And at the stroke of midnight the dance party begins with music from Miami-based DJ, PalmerStylz, and local big shots: Foota Hype and ZJ Chrome. And the drinks and music will flow until 2am. Rocky 876 is sponsored by Wray & Nephew White Overproof Rum, Boom Energy Drink, Wata and ElectroTech Productions Ltd. Tickets are available at LG Service Station (Dunrobin) and Just Call Couriers (355-7390) at the cost of $1000 pre-sold, however the gate cost will be $1500. All tickets equals a chance for a front row seat to live action boxing, all the Wray and Nephew mixed drinks you can drink and pumping music to dance the night away. For more info on Rocky 876 follow the movement on twitter @Rocky876ja, like them on Facebook www.facebook.com/Rocky876JA and for more information send an e-mail to rocky876ja@gmail.com or call 292-5527. Sponsored by Wray & Nephew White Overproof Rum, Boom Energy Drink, Wata and ElectroTech Productions Ltd., Just $1000 pre-sold or $1500 at the gate gives you a front row seat to live action boxing, all the Wray and Nephew mixed drinks you can drink and pumping music to dance the night away. Tickets are available at LG Service Station (Dunrobin) and Just Call Couriers (355-7390). Follow the movement on twitter @Rocky876ja, like them on Facebook www.facebook.com/Rocky876JA and for more information send an e-mail to rocky876ja@gmail.com or call 292-5527.